THE OFFICE of the President has put out a tender for the redevelopment of its website, President.ie, just seven months after the site was overhauled. A tender appeared on the government’s e-tenders website yesterday requesting a “Redevelopment of the website of the Office of the President of Ireland www.president.ie” with a deadline for responses set at 23 January next year. To redevelop the website of the Office of the President of Ireland to claerly communicate thge values and goals of the presidenty of POresident Michael D. Higgons. The issuing of this tender comes just months after President.ie was revamped and relaunched on at the end of May ahead of Higgins’s much-publicised ‘Being Young and Irish’ initiative. This is believed to have cost just under €5,000, meaning that the redesign did not need to be put out to tender. A redesign of the nature of the one carried out typically costs in the region of €3,000-€4,000. On that occasion the work was carried out by the Dublin-based digital marketing firm Ebow which carries a case study of its work on its own website noting that the current website is built on WordPress content management system “to facilitate in house updates”. 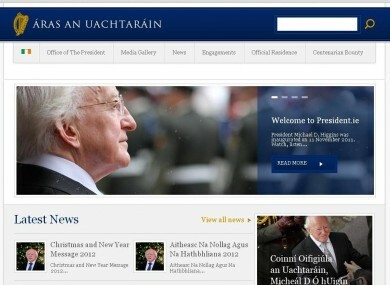 That was the first redesign of the President’s website since 2008 and was intended to give it a “more contemporary look and feel”, according to a statement from Áras an Uachtaráin. The site was overhauled with the updating of the content management system (CMS) to allow for in-house uploading of text, audio and video content and to allow for the site to serve as a platform for the ‘Being Young and Irish’ Initiative. “The Presidency website had not undergone any significant development since 2008 and had become outdated in terms of content and functionality,” a statement said adding that the cost was “within the financial threshold where no formal tendering process was required”. David Douglas, the managing director of Ebow, said that his firm had worked on the website of Áras an Uachtaráin for a number of years including during the previous administration of Mary McAleese. He said that the redesign earlier this year was “not a big build”. The statement from Áras and Uachtaráin added: “The next phase of redevelopment is focussed on delivering a fully functional and flexible website which has the capacity to further interface with social media and which will better inform Irish and international audiences about the Presidency. “In compliance with the Office’s obligations under the Official Languages Act, it will provide more comprehensive Irish language content. It will also feature learning resources for schools and teachers. The statement added that the cost of the redevelopment of the website would be determined by the procurement process but that it will be accommodated within the existing budget for the President’s office. Email “Tender for redevelopment of President's website seven months after revamp”. Feedback on “Tender for redevelopment of President's website seven months after revamp”.